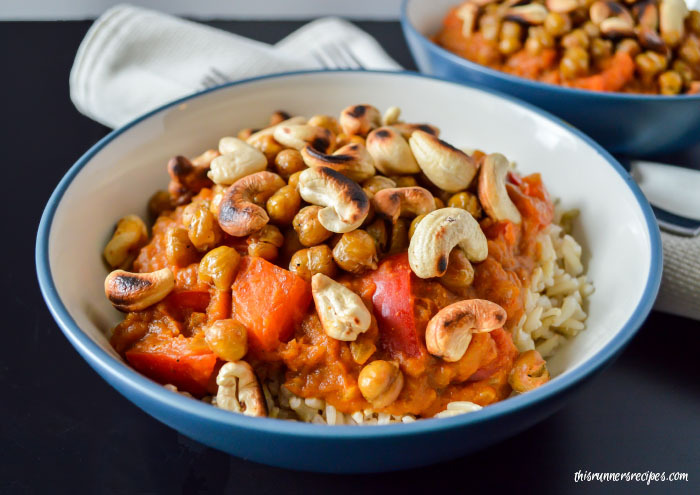 Enjoy pumpkin in a savory and spicy dish with this coconut pumpkin chickpea curry with roasted cashews and brown basmati rice. This vegan and gluten free meal is ready in under an hour and is an simple recipe for enjoying Indian food from the comfort of your own kitchen. This may be to date the best recipe I’ve created and shared on the blog. It’s Halloween weekend, which means I’m stuffing pumpkin into as many meals as possible this week. I stirred homemade pumpkin puree into our oatmeal. Pumpkin soup is on the menu (with pumpkin goat cheese) for Halloween night. 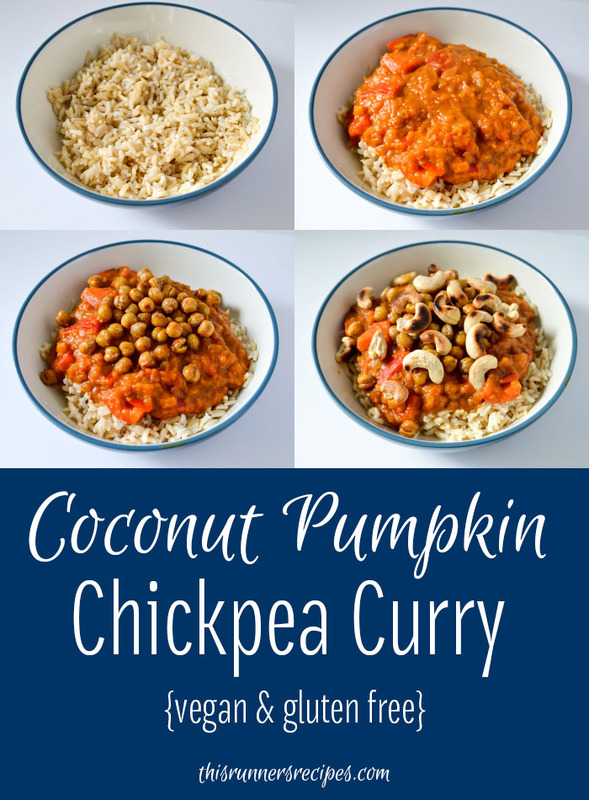 And today I’m sharing with you a meal that we’ve enjoyed twice already this week: coconut pumpkin chickpea curry. I never ate coconut growing up, as my mom is allergic to it. Even then, shredded coconut has always been weird to me, particularly in terms of texture. Once coconut milk became a popular trend in the realm of food and nutrition, I immediately disregarded it. The condensed milk bore a high caloric toll, while even the lower-calorie milk provided a decent amount of saturated fat. I’m oddly stubborn, so once I decide something, I try to stick with that decision as long as possible, even on things as trivial as coconut milk. Recently, I decided to try mastering my own semi-authentic Indian food recipes. The last time I had amazing Indian food was in Cambridge, England, and that was five years ago. While we live in a city full of Indian restaurants, my love of cooking compels me to try making different cuisines at home. Cooking, along with writing, is my creative outlet. I tested and cooked versions of a butter chicken recipes, and then I researched different techniques and recipes for tasty homemade Indian food, until I found a potential solution: coconut milk. My Eat to Run e-cookbook features a lightened-up butter chicken recipe, which I made using half and half. Since cutting cow’s milk and cream of out my diet, we had made this dish with Greek yogurt and as delicious as it was, I still sought to further experiment with my Indian recipes and seriously started considering trying coconut milk. Add to this the fact that lately high-lactose foods have been bothering me (but not low-lactose dairy such as aged cheese and yogurt, thank goodness), and I decided to try coconut milk. I used to love almond milk, but some of the ingredients in it are questionable and overall its nutrition is rather lackluster. Soy and my stomach are enemies, so soy milk is automatically out of the question, but now that cow’s milk bothers me as well, I realized it was probably time to try another type of milk, one that was natural and full of the calcium I need as a female runner. Now that I’ve made this coconut pumpkin chickpea curry, I can’t go back to curries made any other way. This vegan and gluten free dish is lick-the-bowl delicious. The subtle sweetness of the coconut milk enhances the spicy flavor from the turmeric, cumin, chili powder, ginger, and curry powder, while the pumpkin adds a depth of earthy flavor to this dish. 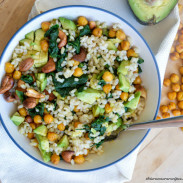 Add in some crispy chickpeas and buttery roasted cashews and put it all onto a bed of fluffy brown basmati rice and you have yourself an irresistible meal. 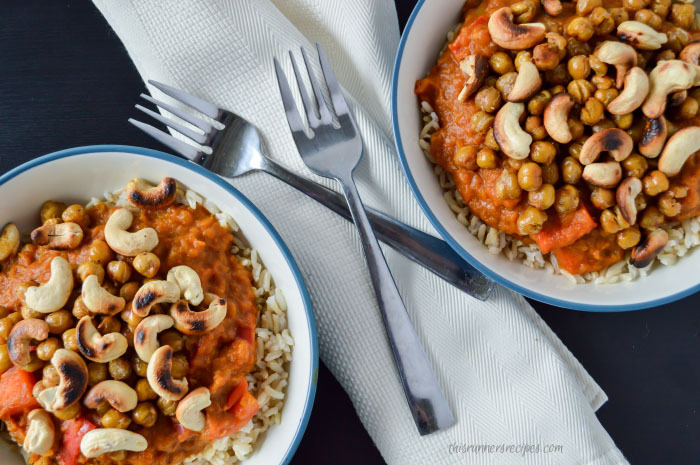 Not only is this coconut pumpkin chickpea curry delectable—it is also full of nutritional goodness and health benefits! The chickpeas and cashew provide plant-based sources of protein and fiber to repair your muscles, satiate your hunger, and fuel your next run. The bright red bell peppers and tomatoes provide antioxidants, the turmeric offers special anti-inflammatory benefits, the coconut milk is rich in calcium, and the pumpkin is full of vitamin A, vitamin C, and potassium. Unlike many calorically heavy curries, this meal is light in calories but rich in creaminess thanks to the pumpkin and light coconut milk. While the version of the recipe presented here is worth making in its own right, I want to offer a modification for any Paleo readers or meat-lovers. The first time I made this dish, I served it with roasted chicken and cauliflower instead of chickpeas and it tasted so incredibly good and was so satisfying (we still ate it with brown basmati rice). For a paleo version, you can substitute chicken in place of the chickpeas and cauliflower rice for the brown basmati rice. One final note: if you aren’t already, consider making your own homemade pumpkin puree. It’s a budget-friendly and easy process, and the final products tastes approximately ten times better than store-bought canned pumpkin puree. All you do is purchase a sugar pumpkin, use a sharp knife to cut it in half, remove the seeds (and roast them – yum! ), and bake the pumpkin halves, cut-side down, in a roasting pan or glass casserole dish for 40-50 minutes at 400 degrees Fahrenheit. Let cool for an hour or more, then scoop the flesh out of the pumpkin, discard the skin, and puree in your food processor. Preheat your oven to 375 degrees Fahrenheit. Bring the water to a boil. Combine the rice and water in an oven-safe casserole dish, cover with the lid or foil, and bake for 40 minutes or until the water is absorbed. Remove from the oven and fluff the rice. While the rice is cooking, toss the chickpeas with olive oil and season with salt. Spread flat on a tray and bake in the oven at 375 degrees for 25-30 minutes or until crispy (you can do this at the same time as the rice). Stir halfway through to ensure even cooking. While the rice and chickpeas cook, heat the oil in a deep pan over medium heat. Peel and thinly slice the shallot and onions and cook for 20 minutes, until caramelized. Finely mince the garlic and add to the pan. Cook for 1-2 minutes. Reduce the heat to medium low. Add the tomatoes and their juice to the pan and stir to mix with the onions and garlic. Stir in the spices and let simmer for 2-3 minutes. Stir in the pumpkin and coconut milk. Use an immersion blender, a food processor, or a blender to puree the mixture. Return to the pan. In a separate skillet, toast the cashews over medium-high heat for 5-7 minutes, stirring frequently, until toasted. Dice the red pepper and stir into the sauce to cook for 2-3 minutes. 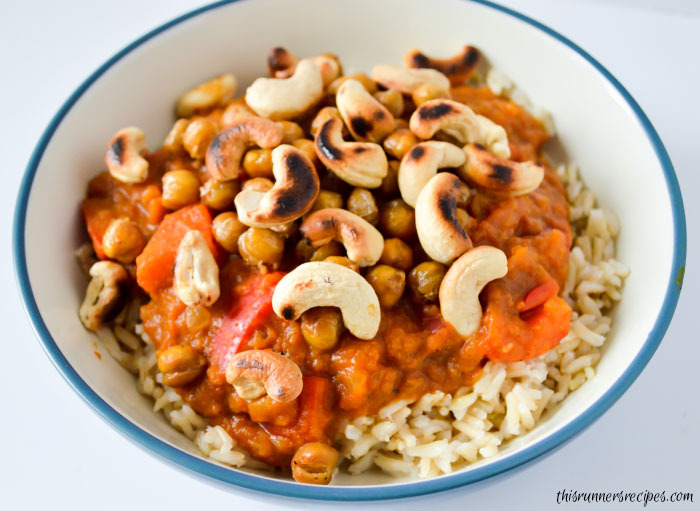 Divide the rice between two bowls and top with the curry sauce, chickpeas, and cashews and enjoy! For a creamier curry, stir 1 tablespoon of butter into the pureed sauce. Looking for more pumpkin-y recipes? Since this curry is so healthy, go ahead and indulge a bit. 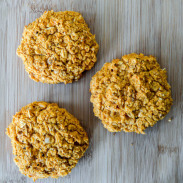 Try my pumpkin spice whole wheat chocolate chip cookies, pumpkin beer bread, or pumpkin spice whole grain butternut squash muffins for seasonal tasty treats this weekend! I’ll be linking up on Meatless Monday, so be sure to check out all of the delicious meatless recipes. Thank you to Tina and Deb for hosting! What is a new-to-you food that you have recently tried? I didn’t like at first either but those flavors definitely grow on you! I hope you had a great weekend! I don’t do Indian/curry enough because my husband isn’t a fan but I really love it! Yum! Thank you! I hope you had a great race at NYC today! Not only are you a great cook but your pictures really show how delicious the food is! I love the addition of pumpkin and cashews in this. I’m going to have to try this. Have a great weekend, Laura! Thank you so much, Angie! I’ve been working hard on improving my photography so that means so much! I hope you enjoy the recipe and I hope you had a great weekend! Yummaayyyyy! I love Indian food. It’s my favourite! I’m staying home with Callum to hand out candy while Andrew and Jason take the big kids out trick or treating. It’s not my favourite “holiday” so I’m really looking forward to it being over. Indian food is so yummy! Handing out candy sounds like the best part of Halloween. I saw your and Callum’s costumes on IG – so cute! Oh I bet this is amazing!! Love those spices with the pumpkin!! And the cashews being all toasty!! Delish! Thank you, Sam! The toasted cashews are my favorite part of it – so delicious! Mmm, this looks so savory and delicious!! This looks great! And I just happen to have all the ingredients on hand 🙂 Have a great weekend Laura! Thank you, Gretchen! I hope you enjoy it if you make it – and hope you had a great weekend! so glad you can still handle low lactose. Thats me too! plus i totally adore aged cheese! OH MY! and this! YUM! Twins! I love aged cheese and am so glad I can handle it – yay for goat cheese especially!. And thank you! Yum – I love a good curry, and this looks delicious! Thank you, Lisa! It is delicious – we ate it twice in one week! Now that is my kind of pumpkin recipe! 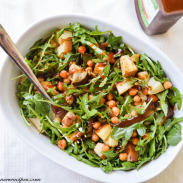 Thanks for linking up with us today for meatless Monday. This looks great!! Thank you – thank you for hosting! im all for pumpkin related recipes and this sounds wonderful..pinning this! Oh my gosh this sounds delicious! I LOVE Indian food and all things pumpkin! Thank you so much! Pumpkin + Indian food is a strange combo, but it works so well! Hi! I was wondering if it would work with the nonorganic coconut oil. I just have the stuff off the shelf at walmart.